Croatian star Dragan Bender sat out of the FIBA U19 World Championship as the latest casualty of the ongoing sneaker war between adidas and Nike. HERAKLION, Crete, Greece — It is inescapable, no matter how far you travel. A basketball writer can renew his passport, leave America on the eve of the summer AAU season, fly 4,930 miles to Athens, get on a connecting flight to an island in the Mediterranean, land with the intention of covering the 2015 FIBA U19 World Championship ... and still end up in the middle of a sneaker war, where Europe's brightest teenage phenom was erased from his national team roster due to a dispute over wearing Jordan Brand or adidas. To understand these wars, how far back they run and why they will never end, you must start with a flag. 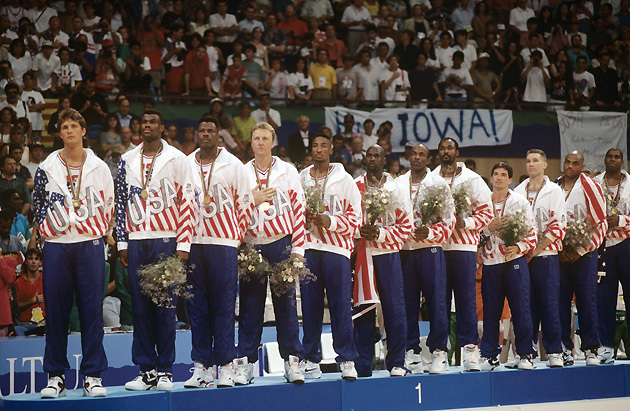 The stars and stripes, draped over the right shoulder of the greatest basketball player in the world, on the gold medal stand, in front of a television audience estimated at 3 billion, on the penultimate day of the Barcelona Olympics, 23 summers ago. The flag Michael Jordan was wearing had nothing to do with patriotism and everything to do with what it was obscuring from the cameras: the Reebok logo on his warmup jacket. Jordan was the prize athlete in Nike's stable, with the company's most lucrative endorsement contract, and he—along with a handful of other Nike-signed Dream Teamers—had tried, in the lead-up to the medal ceremony, to come to a resolution with USA Basketball that would allow them to avoid wearing the logo of its title sponsor. But according to His Airness, the players were told just before heading to the podium, "You can't go out there unless you wear Reebok." The '92 Games was the moment sneaker wars hit the mainstream, and they've played out mostly on U.S. soil ever since. Nike, Reebok, adidas and most recently, Under Armour have been in high-stakes struggles for control of programs, teams and players at the NBA, college and, especially, AAU levels. But in 2014, the multi-billion dollar Nike subsidiary founded by Mr. Flag-over-the-shoulder—Michael Jordan's Jordan Brand—entered into an 11-year contract to outfit the Croatian Basketball Federation. The deal was the first of its kind between Jordan and a national team, and just one year in, it has triggered the biggest shoe controversy yet involving a young European star. 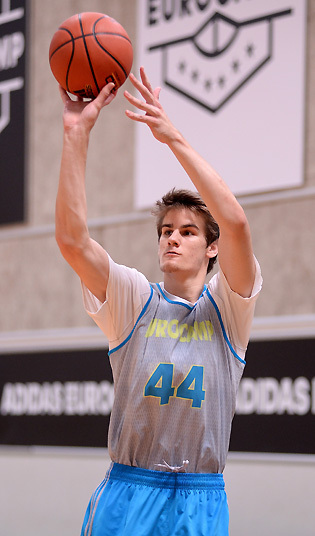 Dragan Bender had his coming-out party last summer, when the 7'1" forward starred for Croatia in the FIBA U18 European Championship as just a 16-year-old. I wrote a feature on him from Turkey—Introducing The Dragonbender—after being wowed by a 34-point, 19-rebound, tour de force against Lithuania, as well as subsequent displays of deft passing (on fullcourt outlets and in the halfcourt), scoring inside and out, and impressive rim-protection. It was clear there were few prospects like Bender anywhere in the world. Bender played this past club season for the second-division team of Israeli powerhouse Maccabi Tel Aviv, and has climbed into the top five of some draft boards for 2016, if he chooses to declare in his first year of NBA eligibility. 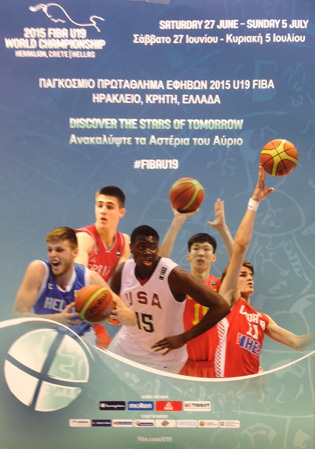 He was one of five players on the official FIBA U19 posters, which were plastered all over the airport in Crete as well as at tournament venues. Seeing him was a top priority for NBA talent evaluators. As one scout told SI this week, "Bender is the No. 1 reason we're all here." But Bender never suited up for the Croatians, who were considered one of the gold-medal contenders along with the U.S., Turkey, Greece and Serbia. News broke on the first day of the tournament that Bender was out, due to the fact that he's signed to an exclusive endorsement contract with adidas, and the Croatian federation was taking a hard-line stance on its players wearing Jordans or Nikes, in order not to jeopardize its own lucrative contract with Jordan Brand. Neither side budged, and so Bender watched Croatia's first two games from the stands, flanked by his Italian agent, Maurizio Balducci, and then flew home on Monday. NBA scouts—not to mention media and Croatian fans—were dismayed. A different scout told SI, "It just boggles my mind that the Croatian federation, which should be trying to win tournaments, did something that prevented its best prospect from playing." • According to Balducci, Bender signed an exclusive endorsement deal in September 2013 to wear adidas sneakers. This was confirmed to SI by adidas' director of global sports marketing, Jim Gatto. • Bender, however, appeared in the 2014 European U18s for Croatia wearing Jordans. Why did he do that? He was far less of a marketable prospect at the time, so there was less at stake for adidas; he wanted to play for his national team, which had the hard-line rules about Jordans; and one source told SI there was a threat of a FIBA suspension against Bender if he refused to appear in the tournament due to his shoe deal. "We didn't want to have problems then," Balducci told SI, "and so right at the end [Bender] accepted to wear Nike. Of course, adidas was not so happy, and this time [in 2015], we needed to make it clear that he has an obligation with adidas. We wanted to make it clear that in basketball, in every part of the world, all players should have the option to play with the shoes they use all year long and are comfortable with. They cannot come into events this important and change their shoes. "This would be like asking a tennis player to change his racquet the day before Wimbledon." • On June 18, Balducci sent an email to the Croatian federation, telling them that Bender must fulfill his adidas contract, and thus could not acquiesce to the federation's demands he wear Jordans. Balducci did not receive a response. Bender wore his adidas shoes in Crotia's friendlies in the lead-up to the U19s, was allowed to play, was included on the official roster, and traveled to Crete with the team. It wasn't until the eve of the tournament that things came to a head. Vanjak told SI that the federation's position was "very simple. The national team is the top priority. The national team is something special. Bender's private contract [with adidas] is against the contract he signed with our federation, when he started to play with the federation, that he will play in what the national team gives to him. We can't risk that Jordan Brand stop this contract—it's a very good contract for us." • Bender, in consultation with Balducci, did not give in to the federation. And the federation did not give in to him. Thus, when they played their first game on June 27, he was off the team. "We know we would be a better team with Bender," Vanjak said, "but the contract is the contract." • Oddly enough, Bender had three Croatian teammates—Ivica Zubac, Ante Zizic and Nik Slavica—who were also signed to adidas deals yet consented to wear Nikes or Jordans for the U19s. But Zubac, a 7-foot center who's been one of the breakout stars of this tournament, and has put himself on scouts' radar, revealed that his good friend Bender was in a more financially problematic situation. "Dragan has a bigger contract with adidas than we do," Zubac said of him and the two other Croatians. "He's got to pay more money if he wears another shoe. I took the Jordan shoe because it was more important for me to play for the national team, and I'm going to be penalized, but I think not as much as Dragan." Zubac also said that his own decision to play was influenced by the possibility of a suspension. He plays for Cibona Zagreb, a Croatian club that falls under the federation's jurisdiction, and believed that had he refused to appear in Jordans, he could be suspended from club competition. He said that Bender faced a threat from the federation of a FIBA suspension, but speculated that they could exert less pressure on Bender due to him being signed with an Israeli, rather than Croatian, club team. • Adidas' Gatto told SI on Wednesday that the company was trying to come up with a solution for Bender that would apply to future appearances with the Croatian national team. "Bender is a very good partner for us, and he wants to be a part of the future of adidas," Gatto said. "We're in discussions with all parties about this, working on a common goal—to get him playing again—and hopefully it can work out." Gatto would not elaborate on the nature of those discussions, but one shoe-industry source said any progress would likely have to involve lawyers from adidas, Jordan and the Croatian federation, along with Bender and his agent, negotiating a compromise. • Jordan Brand's global communications director, Brian Facchini, responded to SI's questions about Jordan's Croatian deal and its influence on the U19s with this statement: "We don’t discuss the specific details of our agreements with athletes or federations but the current partnership replicates the arrangement the federation had with its previous sponsor. We support how the Croatian federation manages its athletes and partnerships and we are proud to be their official partner." As for Bender, it was evident—even from just seeing photos of him in the stands earlier this week—that he was depressed by the situation. When I interviewed him last summer he was a genial kid who was content to carry water bottles for his older teammates, even though he was the team's star; it was hard to imagine him preferring to go home over representing his country. "Dragan was very sad," his teammate, Zubac, said. "He trained all summer very hard, he risked getting injured, because he had pride in representing his national team. "He told us good luck and try to be the best we could with out him. He didn't apologize to us, but I didn't think he had to apologize for anything. We can't do anything about it." On the eve of his departure from Crete, Bender sent out a Tweet that seemed to be an attempt to convey his feelings. Bender couldn't force himself to forget, and as scouts and media members trickled into Greece for the later rounds of a Bender-less tournament, it was impossible for them to ignore that he was gone, either. His face was still on all the posters. His Croatian team, which faces Australia in Friday's quarterfinals, is unlikely to contend for a medal without him. Everyone present had been pining to see him go up against possible future pros such as U.S. forward Harry Giles or Greece's Georgios Papagiannis. But the Dragonbender was caught in sneaker war crossfire, forced to stick to either to an adidas contract that would keep him off the court, or an unbending national program that refused to accommodate his endorsement deal, and would cost him money if he played in their shoes. Adidas was protecting its monetary interests, Jordan was protecting its monetary interests, Croatia was protecting its contract, and a 17-year-old, in a saddening result, lost his freedom to make a pure basketball decision about playing for his country in a world championship. No one in Crete seemed to be able to rationalize this outcome, but the most accurate summation came from Croatia's U19 coach, Ante Nazor. I found him outside Heraklion Arena on Wednesday, smoking a cigarette following a win in the Round of 16, and asked him about his predicament. He gave a helpless shrug. He already had a depleted team due to injuries, and the loss of Bender made them an extreme longshot for gold. Nazor had to side with the federation—he said the contract was clear—but would've preferred to have Bender on the roster, and was unsure if Bender would be back for any youth-team events. "I don't know what will happen in the future," Nazor said. "We'll see. But this—this is a stupid situation."